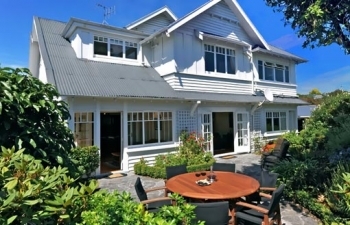 Kershaw House Boutique Accommodation is a luxury Private Hotel & Bed and Breakfast, located close to all main attractions of the nelson region,including the Abel Tasman National Park. we are just 10 minutes from the nelson airport,many wineries,boutique breweries. Kershaw boasts spacious luxury en-suited accommodation and private surroundings, great areas to relax in the guest lounge, sun room, take a spa or sit in the plentiful outdoor garden setting after your busy day or just spend your day in total relaxation. Off street parking on site and we have cycles and golf clubs available and can cater for all your requirements. Breakfast is included in your accommodation and we also cater for evening dinners or picnic lunches should this be required. Kershaw is a short 5 minute walk into central Richmonds shopping center.